Michael Theunissen applied a motto to his understanding of his own philosophy, drawn from Kierkegaard: to aim to be a corrective to one’s time. However, he did not take this to imply merely the vigilance of an intellectual who identifies, explains and criticizes moral and political distortions, any more than did the thinker to whom he remained devoted from his 1958 doctoral dissertation on The Concept of Seriousness in Kierkegaard right up to his final texts. 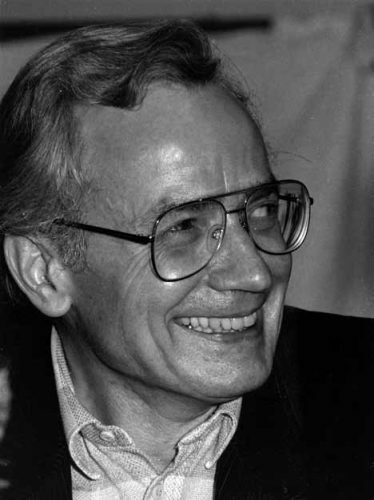 Michael Theunissen, who died on 18 April at the age of 82 in his home city of Berlin, grew up during the National Socialist era, in the oppositional circles of the Confessional Church, which emerged in reaction to the regime’s attempts to Nazify Protestantism. His concern was always to strip away the taken-for-granted character of the values, worldviews and self-images of the present. Whatever was thought to be self-evident, or regarded as natural or immutable, was to be disclosed in its dubiousness, its vulnerability to change, its historicity. To achieve this, Theunissen employed a method of alienation – seeing oneself through the eyes of an outsider. Philosophical certainties were forced into confrontation with theology, aesthetics and the sciences. This alienation-effect made Theunissen himself into a kind of foreign body. For many philosophers he was not philosophical enough, while practitioners in other disciplines found him too philosophical. On the one hand, a fear of contamination by his thinking was felt from time to time in academic philosophical circles. On the other hand, his outsider status meant that his thought exercised a strong power of attraction over colleagues and students. For Jürgen Habermas, Ernst Tugendhat and Dieter Henrich, Theunissen remained throughout his life an important conversation partner. Even more than through his writings, it was his activity as a teacher of philosophy, in Bern, Heidelberg and then Berlin, which had an effect – an impact quite different from that of a conventional professor or the leader of an academic school of thought. In terms of the history of philosophy, the main points of reference for Theunissen’s work stretch from early Greek poetry, via German Idealism, to phenomenology and Critical Theory. His new interpretations of the history of thought were marked by scepticism with regard to supposed theoretical oppositions, such as ‘metaphysical versus a postmetaphysical age’, ‘Marxism versus existentialism’, and so forth. He was interested both in the intersections between apparently incompatible theories and in the points of contact between disciplines. Philosophy, theology and art, he believed, would all be worse off if the dialogue between them were to fall silent. One of the guiding threads of Theunissen’s work is a philosophical anthropology, derived from Kierkegaard, which probes into the human condition. Theunissen investigated the preconditions for the successful living of a human life with a particular eye for their ambivalence. As conditions under which a human life can come off well, they are the basis for the possibility of being a self. But as conditions of success they also define the limits of what is open to human beings. This means that living successfully depends on us recognizing our own limitations, while failure occurs when we refuse to acknowledge what lies beyond our control, what our restricted possibilities bring us up against. intersubjectivity, the time of a life and justice, but also negative factors such as death, are all traced as anthropological structures characterizing human life as such. On the other hand, this systematic knowledge goes along with an appeal to the irreplaceable self-understanding of the individual. Access to the human form of life is opened up by a unique perspective of understanding, which interprets phenomena and the content of experience. This irreplaceable appropriation has two aspects. Epistemic indispensability consists in the fact that the contents of experiences are assessed from the standpoint of the first person. The starting point is always the individual, who makes an image of things for herself and develops an independent perspective, from within a community. Evaluative indispensability means that no judgement is made concerning what is good for human beings in general, but rather concerning what is important in my own temporal existence, even though this may be shared with others. Self-understanding is subjective is a radical sense, since it cannot be transferred to others, and only has validity for one’s own conduct of life. But it nonetheless raises a claim to knowledge, since it concerns experiences that are intrinsic to human life as such. In this way, Theunissen effects a change of paradigm from a priori to historical knowledge. Instead of appealing to dubious assertions concerning historical invariables, he employs a critical hermeneneutics that tests its anthropological assumptions against historical materials. His interpretations of texts from the tradition – empirically dense and backed up by philological expertise – reveal observations that, despite historical displacements and transformations, can be traced all the way back to early Greek poetry. Modern experiences can be shown to be at work in Pindar’s lyric verse, as in Pindar. Menschenlos und Wende der Zeit (Pindar: Human Fate and the Turning Point of Time), 2001. In the light of their own strangeness, which this procedure reveals, the self-certainties of modernity lose their unquestionability. Theunissen describes the theoretical basis of his anthropology as dialectical negativism, which he connects to the tradition of dialectical philosophy. (See, for example, Kierkegaard’s Concept of Despair, Princeton University Press, 2005.) Here dialectics is the name for the priority of the positive in its conflict with the negative, regarded as an independent though not equal principle. Dialectical philosophy tries to harmonize a conception of truth and morality as basic principles with the opposing diagnosis of a self-inflicted blindness and immoralism. Theunissen subdivides negativism into substantive and methodological variants. Substantive negativism is the view that a philosophy that seeks to do justice to historical, social and existential realities has to start from a diagnosis of negative phenomena. Its diagnostic power is nourished by the recognition of conflicts, crises and suffering. The defining characteristic here is the way in which the negative operates as an independent force, in so far as it is an outcome of freedom. With this idea, Theunissen connects up with Hegel’s and Heidegger’s critiques of metaphysics, taking his distance from the privative conception of the negative which reigned in traditional, Aristotelian metaphysics. According to this traditional view, illusions are accidental, violently occasioned blockages of a capacity for reason that – in the absence of external impediments – strives spontaneously for truth. Deception plays a role here exclusively as an externally caused defect, lack or dysfunction of a capacity. By contrast, substantive negativism takes account of a form of illusion that has its own independent reality, regardless of the priority of truth. Theunissen describes this autonomous kind of illusion as a phenomenon of self-deception. Such selfdeceptions are forms of cognitive relief, which enable us to avoid compulsion and distress by making do with simplified images of self and world. The unissen traces the historical versions of this phenomenon of self-deception, from the acedia of the Middle Ages (which differs from Aristotle’s concept of melancholy in its stress on the responsibility of the sufferer), via Kierkegaard’s concept of despair, up to Heidegger’s notion of inauthenticity and Sartre’s theory of bad faith. The strength of substantive negativism derives from the way its descriptions of self-deception offer a frank and uncurtailed image of reality. Human agents do not fit the image of a rational weighing-up of interests: one must acknowledge the independent force of the negative, rather than trying to argue it out of existence. Methodological negativism pursues a programme of starting from the negative in order to bring the positive into view. The negative is indeed an independent force, but it does not stand on the same level as the positive, to which – in the final analysis – priority is due. Two assumptions are connected with this programme. One is that the positive can be described structurally as a negation of the negative: what it means to live a successful life is revealed by describing how one succeeds in hemming-in the negative. The other is that we have to take account of a remnant of contingency that cannot be conjured away by any epistemological process of enlightenment. The conflict between two independent forces remains undecided – there is no certainty that the positive will necessarily gain the upper hand. This recognition of indissoluble contingency marks the difference from Hegel, who transforms dialectic into speculation. The term ‘dialectical negativism’, the title of a Festschrift for Theunissen’s sixtieth birthday published in 1992, expresses, then, a duality of tradition and rebellion. Theunissen inherits Hegel’s dialectic, and at the same time takes sides against Hegel in favour of Schelling’s late philosophy, Adorno’s negative dialectics and Heidegger’s concept of the Ereignis, each of which in its own way tries to do justice to contingency. Theunissen stresses contingency on two levels. First, negativism is brought forward as a counterproject to moral normativism, which nonetheless does not abandon claims to a normative ethics. (See Negative Theologie der Zeit; Negative Theology of Time, 1991.) A successful life presupposes the unity of one’s self-relation and of social relations. But this unity, which Theunissen explores through the concept of ‘communicative freedom’, is made possible by a contingency that reveals the moral autonomy central to Kant’s ethics of the ‘ought’ to be an inadequate basis for ethics. However, Theunissen’s insistence on contingency is not intended to discredit ethics and social theory. On the contrary, his critical solidarity expresses the conviction that one can only do justice to the forms of the social and the moral by taking account of a contingency which social theory and ethics alone cannot make good. Second, with the thought of contingency, the concept of rationality is shifted into a perspective opened by the philosophy of time. Theunissen’s negativism takes leave of the idea that the transition from possibility to reality occurs with necessity. He rejects the idea that the capacity for reason realizes itself ‘timelessly’ (metaphysics), ‘by nature’ (naturalism), or has ‘always already’ done so (transcendental philosophy), so that irrationality is merely an accidentally produced deviation. The necessity in line with which a potential for rationality is actualized is, for Theunissen, no timeless invariant, but something which itself evolves in time. Contingency here takes on the form of fate, on which a history of the emergence of reason depends. Reason realizes itself – in a way that only appears paradoxical – through a contingency that breaks open history as the eternal return of the same, a history whose promises of freedom and happiness remain unfulfilled.